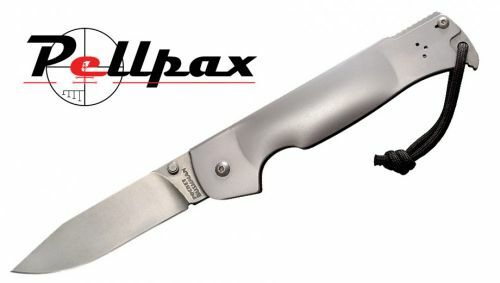 Home » Blades » Knives » Folding Knives » Cold Steel Pocket Bushman Hunting Pocket Knife 4.5"
The Cold Steel Bushman knife is well known amongst survivalists for its usefulness and reliability. This is because of the 4 1/2", carbon steel blade that is razor sharp and extremely strong. This knife is the folding version of the famous Bushman than measures only 10 1/4" and is light enough to fit into any pocket or carrying pack. The economically simple design of this knife makes it quick and simple to operate as well as making it cheap to manufacture, leading to a tool that out performs many of its more expensive competitors. Put simply, it is impossible to cut better for less.